Supplier & Manufacturer of Turmeric Oil. Turmeric has antiseptic qualities and hence its oil is also used for medicinal purposes. This is extracted from best quality raw turmeric. This oil is widely appreciated among client for its purity.We have co2 extracted and solvent extracted turemric oil. Industrial usage: Turmeric oil is used as spice in food industry. It is also used in pharma industry where it is used in making anti-inflammatory, pain relieving, anti-microbial, anti-fungal, antiseptic (and more) drugs / ointments. 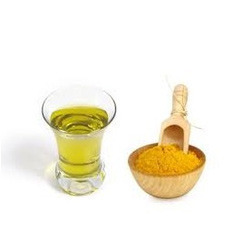 We are counted amongst some of the leading manufacturers and exporters of Turmeric Oil. These oils are extracted by co2 (SCFE) using advanced technology in order to provide our clients with best-in-class products. well-known for its anti-inflammatory, antioxidant, anti-microbial, anti-malarial, anti-tumor, anti-proliferative, anti-protozoal and anti-aging properties. Looking for Turmeric Oil ?